Coconut oil does not require the enzyme stress that vegetable oils do, preventing T4 to T3 hormone conversion. Considerable research has shown that trans fatty acids – the nasty ones present when vegetable oils are highly refined (hydrogenated or partially hydrogenated) – are especially damaging to cell tissue and can have a negative effect on the thyroid as well as health in general. Trans-fats don’t allow the correct conversion of thyroid hormone T4 to T3, which is symptomatic of hypothyroidism. To create the enzymes needed to convert fats to energy, T4 must be converted to T3. 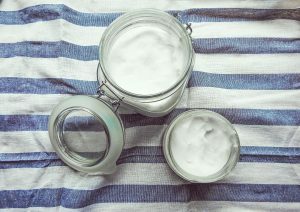 Coconut oil is unique in its ability to prevent weight-gain or cure obesity, by stimulating metabolism. It is quickly metabolized, and functions in some ways as an antioxidant.